Uillinn, West Cork Arts Centre, 24th May 2019. 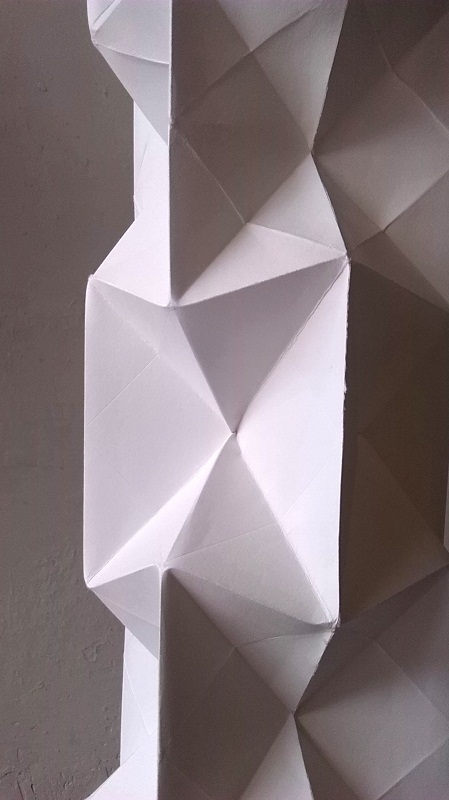 2019 – Currently developing new works in paper for a solo exhibition titled Implicate & Explicate Order, at Uillinn, West Cork Arts Centre, Skibbereen, County Cork, Ireland, opening on 24h of May. Uillinn, West Cork Arts Centre. 24th /25th May, 2019 Visual, Centre for Contemporary Art, Carlow Arts Festival. 7/10 June 2019. Limerick City Gallery. 13/15 June 2019. Crawford Gallery, Cork Midsummer Festival. 17/18 June. CIACLA, Los Angeles. 15/17 July. I was invited to create new work for this exhibition by Curator Anne Boddaert. 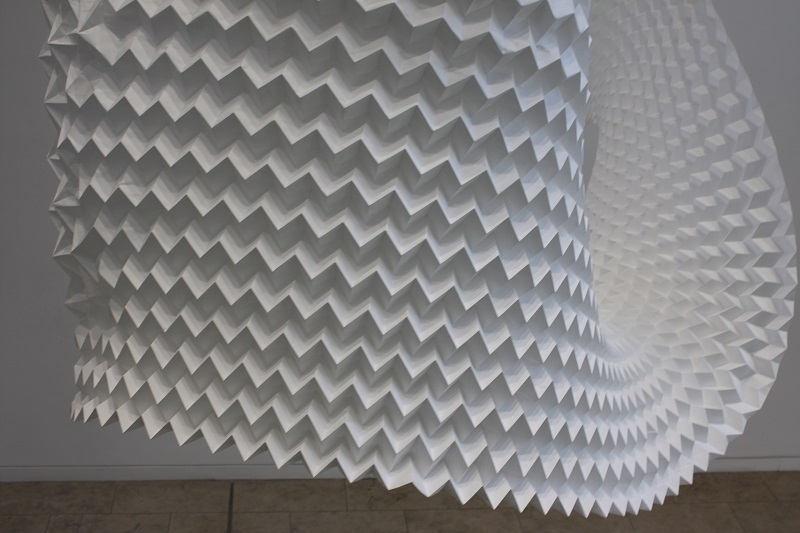 Unfolding Space is a development of ideas that takes inspiration from rigid origami unfolding surfaces that are currently being used to research areas as diverse as micro medical devices, robotics and spiral galaxy formation. This is a durational work with new works being added to the space over the duration of the exhibition. 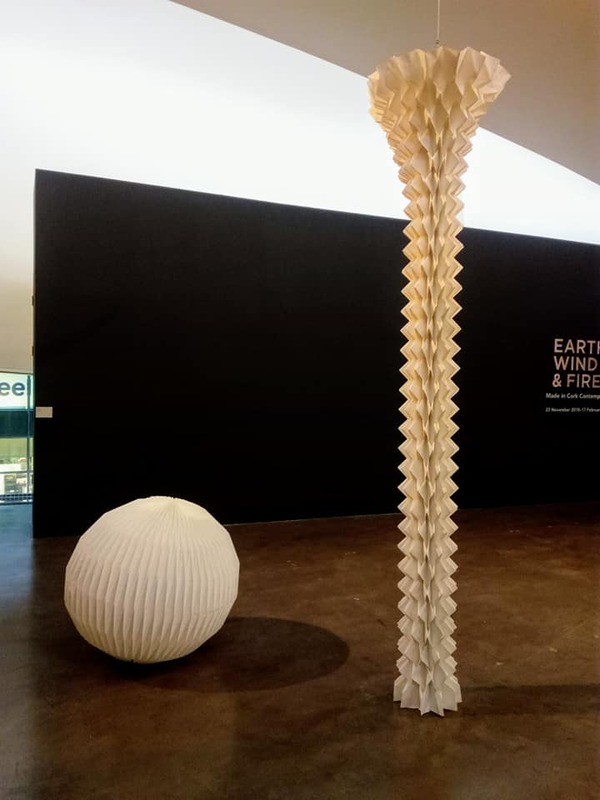 Unfolding Space #2 & 1 (left to right. Images Alex Pentek). 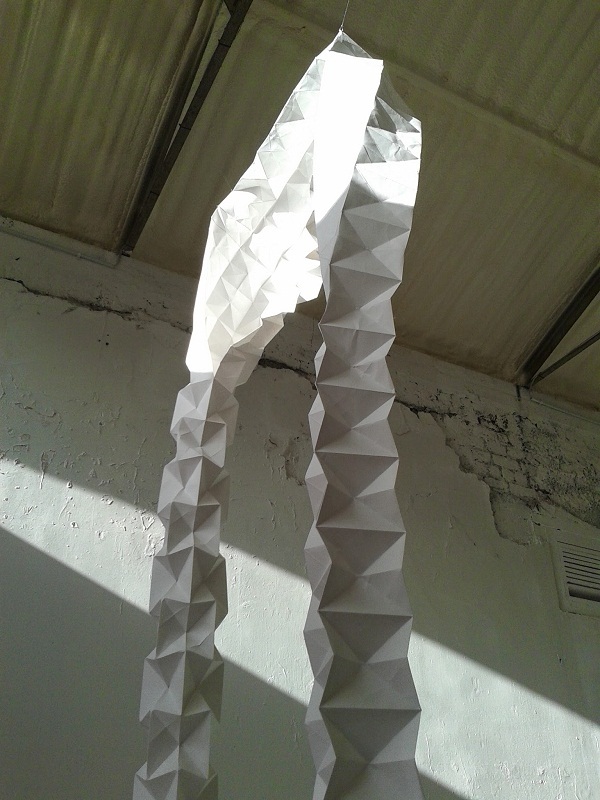 Unfolding Space # 2 (detail). 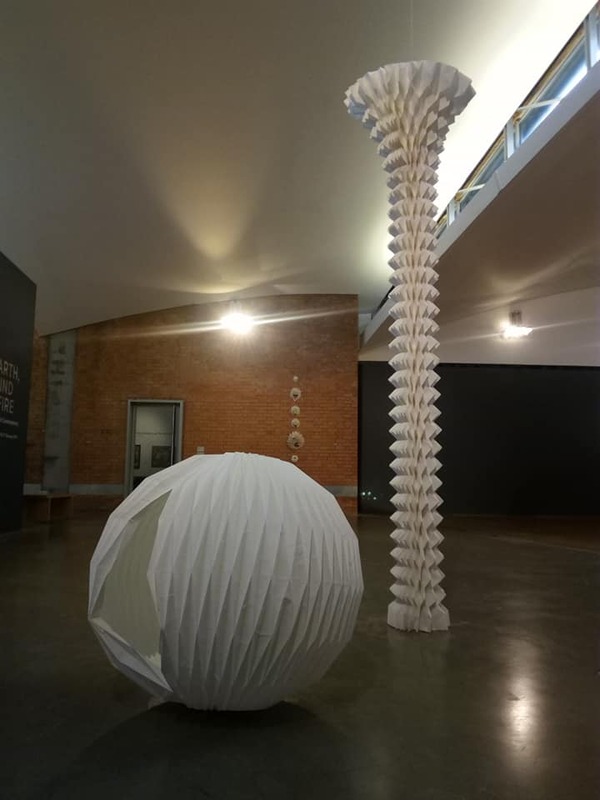 The two smaller works are from identically folded and sized sheets of paper, with an emphasis on folding the poles to create the spherical form of Unfolding Space #2 and an emphasis on folding the equator to create the reversed sphere form in Unfolding Space #3. Though each one of this pair appears to be different, made from identical components they each contain all the information of the other opposite work, suggesting connections between the hidden and the obvious or an implicate and explicate order. 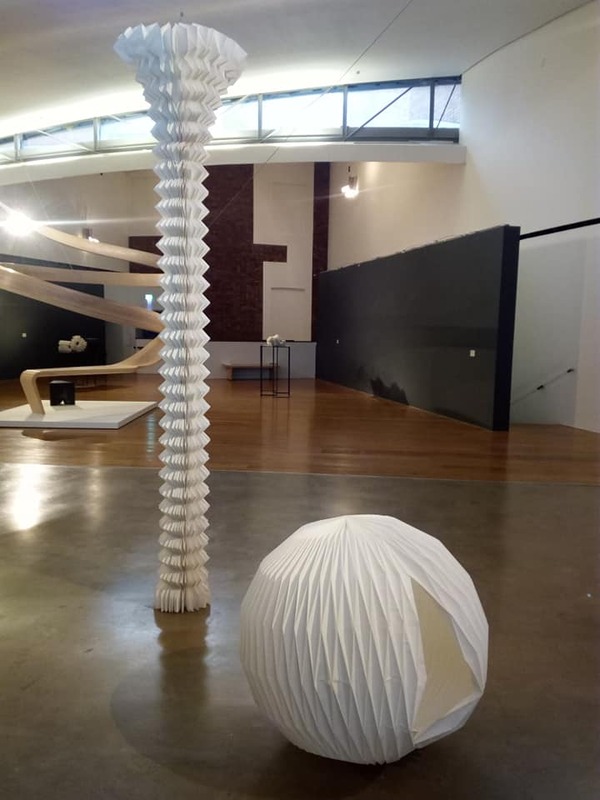 Curator Victoria Evans invited me to create and exhibit a new paper installation for the Royal Hibernian Academy (RHA), Ely Place, Dublin, Ireland which opened on 19th January 2018. This ran until April 2018, alongside gallery exhibitions by Grayson Perry, Elizabeth Magill, Niall de Buitléar and a selection of Irish/American landscapes. Alex Pentek. 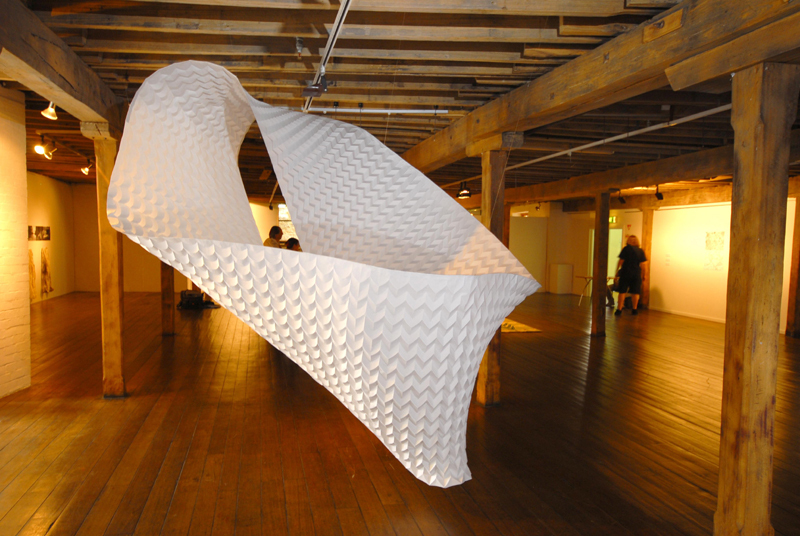 Folded Space. 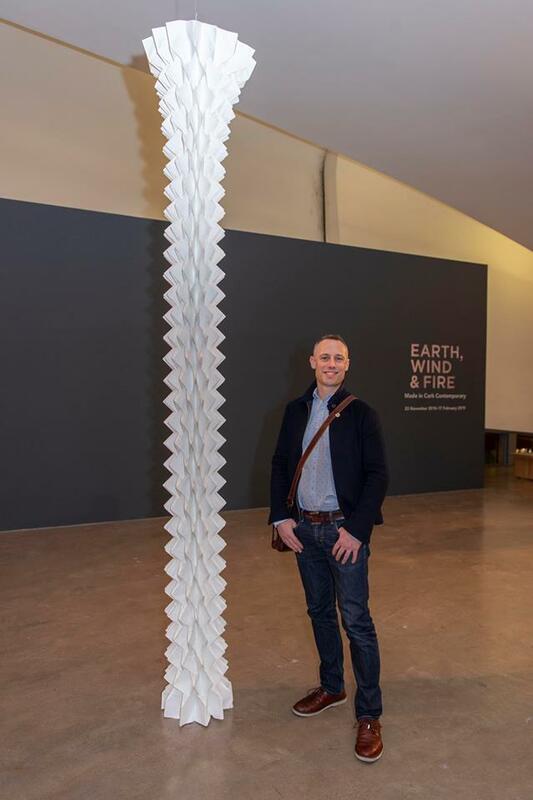 2018.Folded paper 9 x 1.5 m. RHA Gallery, Ely Place, Dublin, Ireland. (Image Victoria Evans). Alex Pentek. 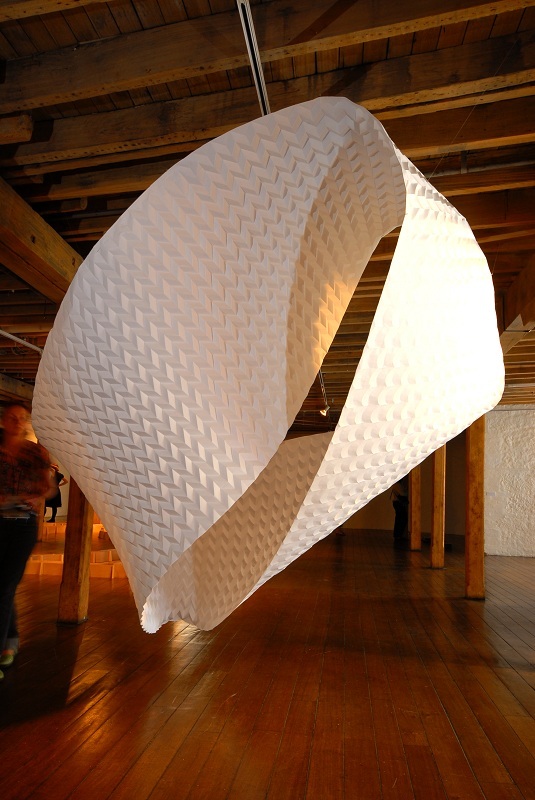 Folded Space. (Detail). 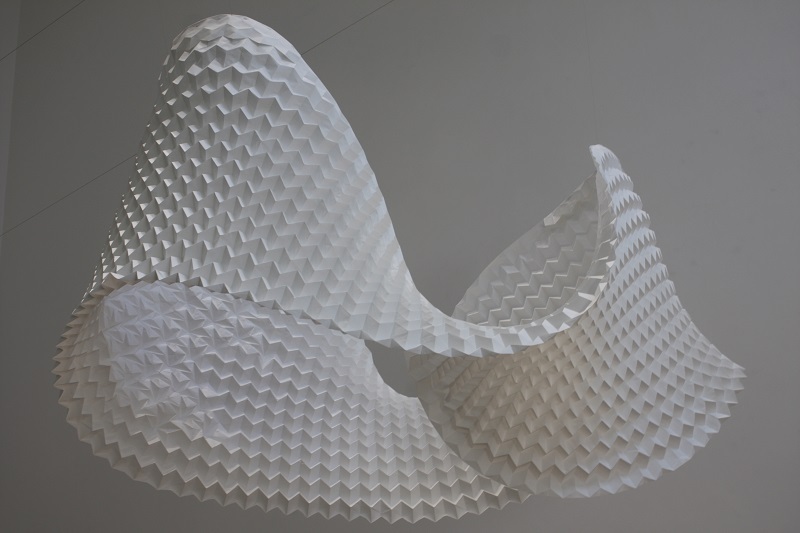 2018.Folded paper 9 x 1.5 m. RHA Gallery, Ely Place, Dublin, Ireland. (Image Victoria Evans). 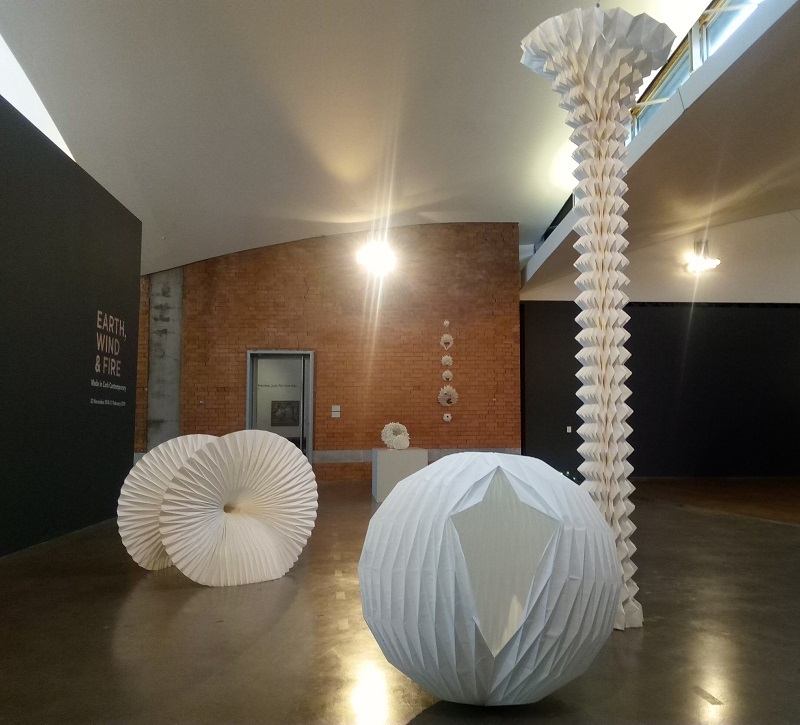 The following is a selection of works exhibited in Ireland and Australia. Alex Pentek. The Intimacy of Distance. 2011. 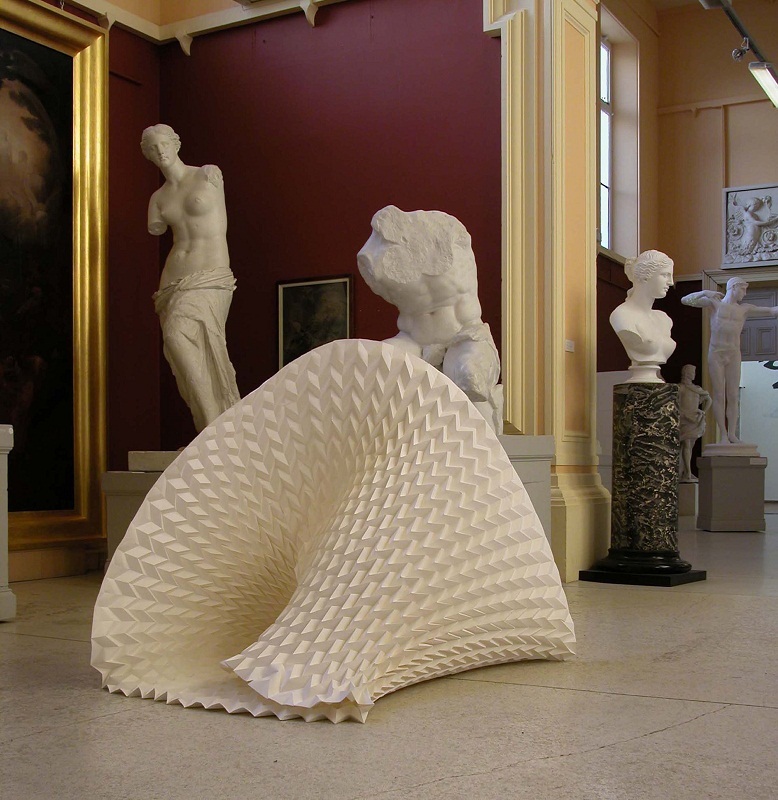 Folded Paper 10 x 1.5 m. Gravity, Crawford Gallery, Cork, Ireland. (image Daragh McGrath). The Intimacy of Distance. (Detail). ‘Otherness’. (single folded sheet of paper). 2007. Salamanca Arts Centre, Hobart, Tasmania, Australia. Otherness. 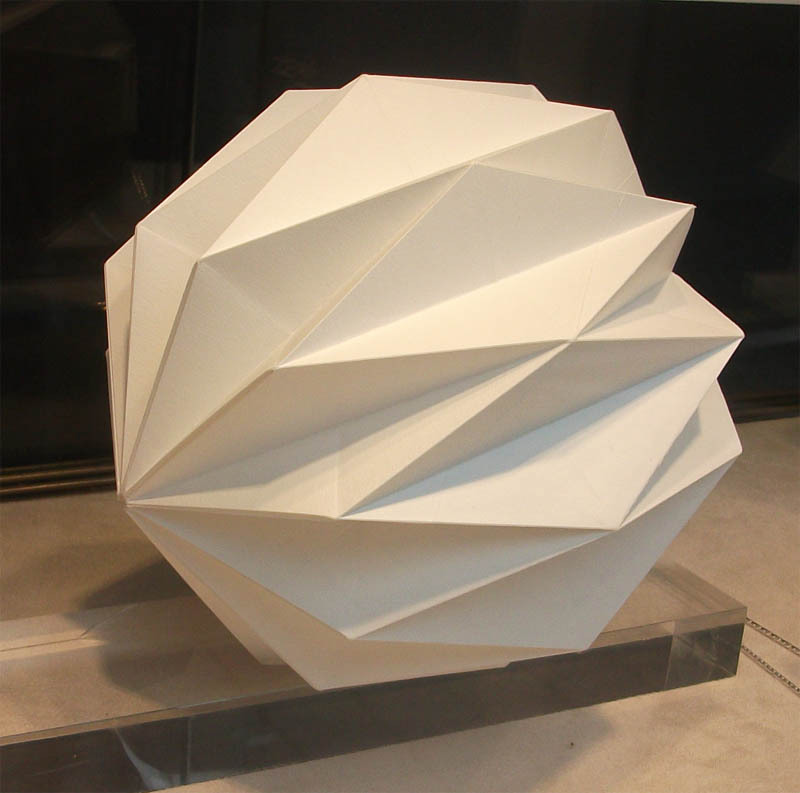 folded paper. 2007. (images Craig Opie). Otherness (Detail). 2007. image Craig Opie. Alex Pentek. 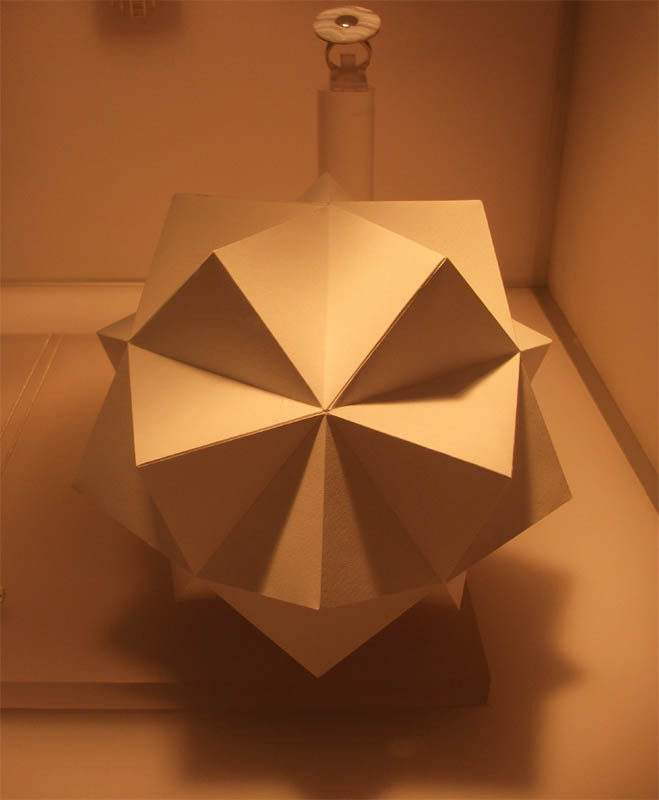 Stellated dodecahedron. 2014 ( single folded paper sheet). 16x16x16cm. 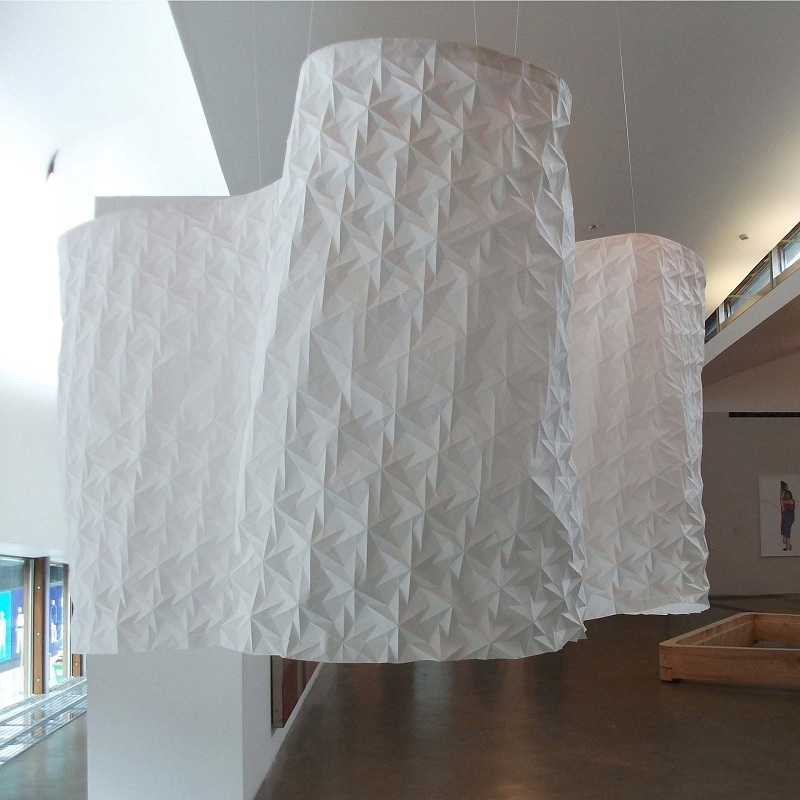 Rudolf Heltzel Design, Kilkenny Arts Festival, Kilkenny City, Ireland. Alex Pentek. Klein Surface. 2014. (single folded paper sheet). 30x25x20cm. Rudolf Heltzel Design, Kilkenny Arts Week, Kilkenny City, Ireland. Alex Pentek. Water Bomb Vessel. 2014. 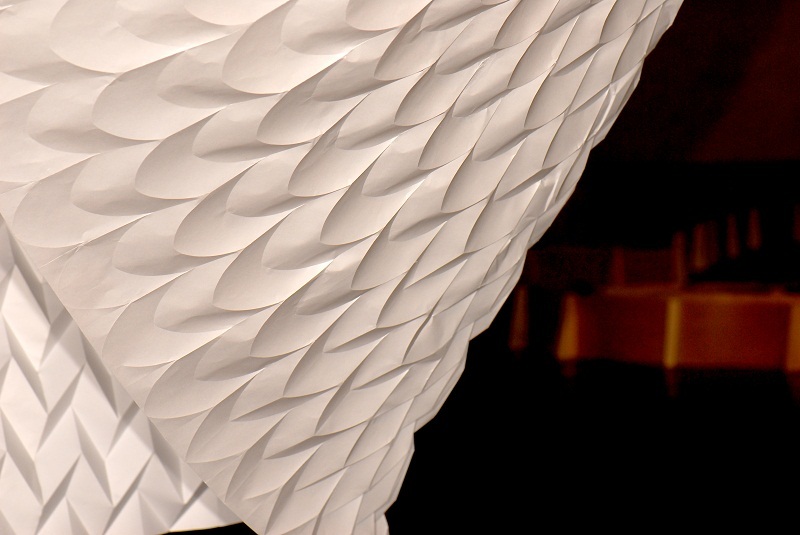 (single folded paper sheet). 30x20x20cm. Rudolf Heltzel Design, Kilkenny Arts Week, Kilkenny City, Ireland. Alex Pentek. 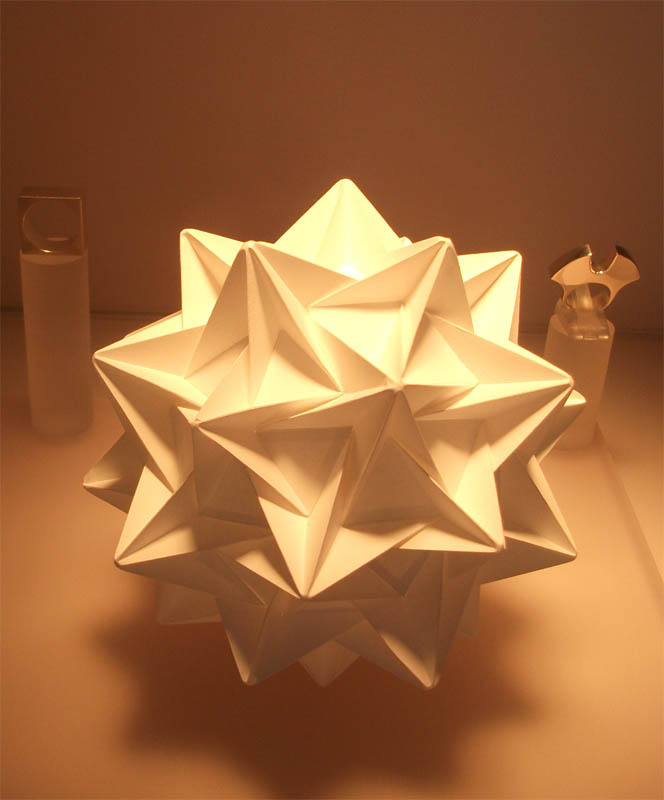 Stellated Icosahedron. 2014. 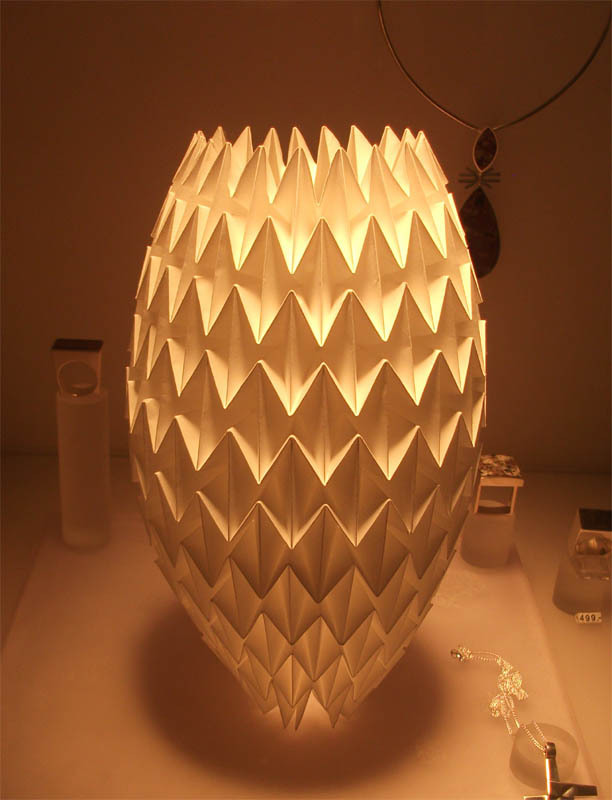 (single folded paper sheet). 16x16x16cm. Rudolf Heltzel Design, Kilkenny Arts Week, Kilkenny City, Ireland. 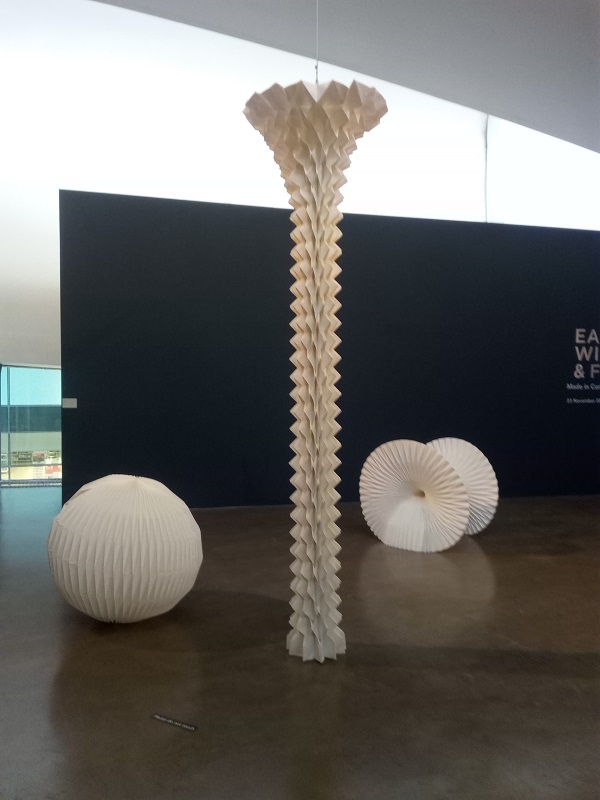 (A diagram of the crease pattern & instructions for this sculpture can be found under the Studio heading). Alex Pentek. Spheroid. 2014. (single folded paper sheet). 16x16x16cm. 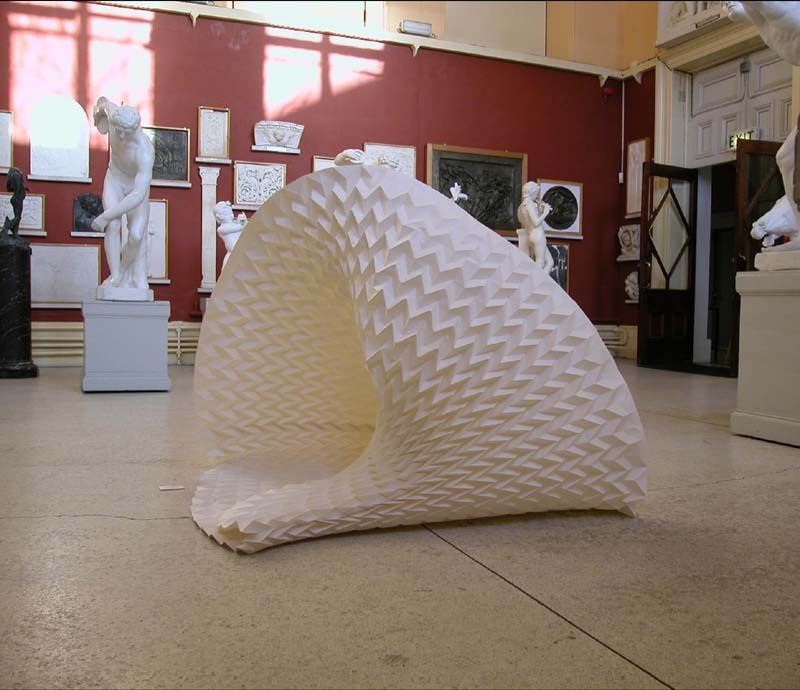 Rudolf Heltzel Design, Kilkenny Arts Week, Kilkenny City, Ireland. Alex Pentek. Transcending Column (Detail). 2014. 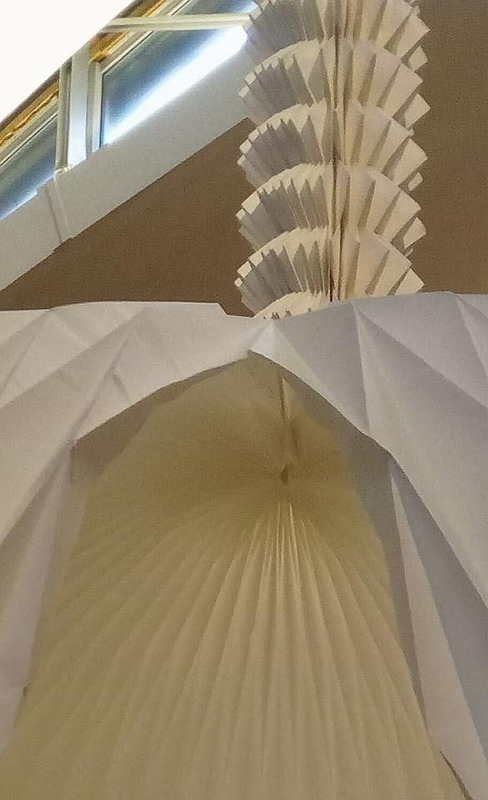 Single folded sheet of paper. H. 4m. MART Gallery, Rathmines, Dublin, Ireland. Cellular Automata. 2005. 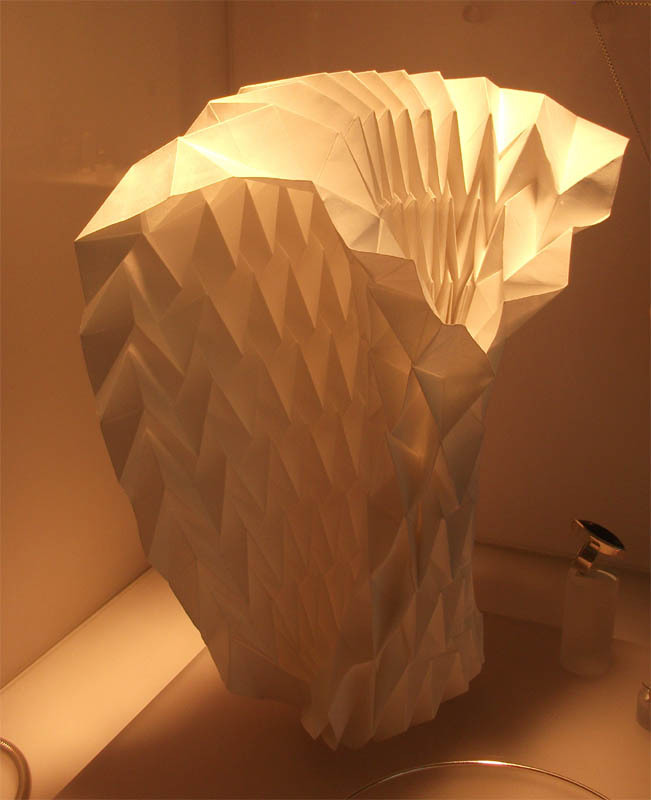 (Folded from single paper sheet). C2, Crawford Gallery, Cork, Ireland. (Image Stuart Coughlan). 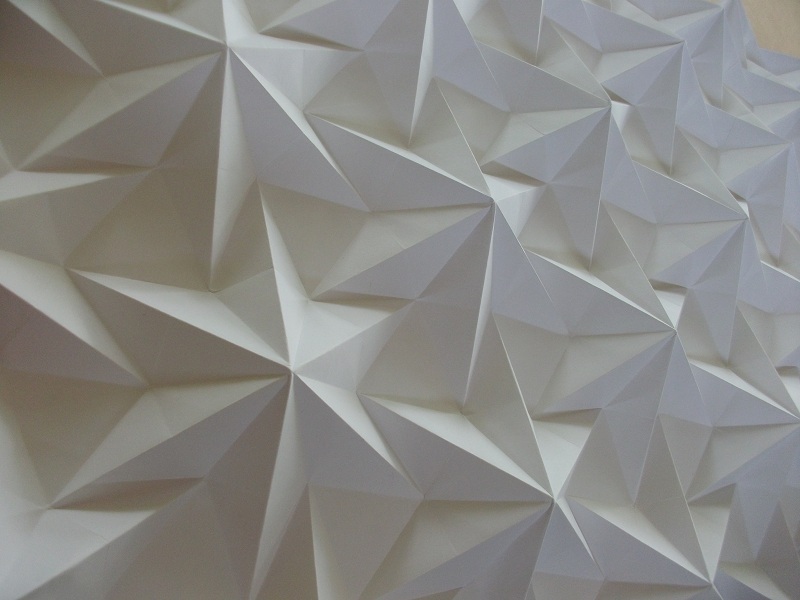 Alex Pentek – Cellular Automata. 2005. (Image Stuart Coughlan).